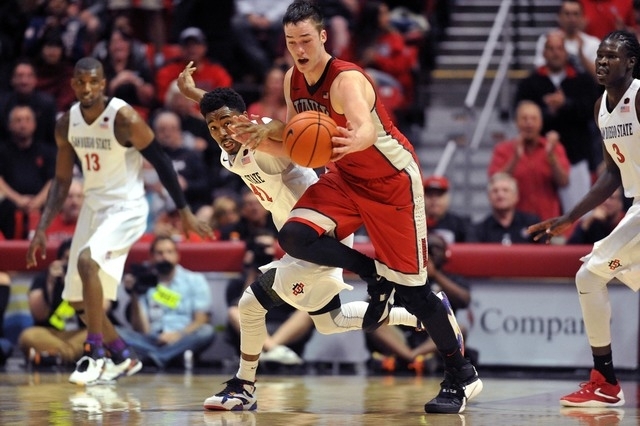 The Mountain West men’s basketball tournament begins Wednesday at Thomas & Mack Center with host UNLV playing as the No. 7 seed against No. 10 Air Force at 1:30 p.m., the league announced Sunday. San Diego State will be the top men’s seed and Fresno State the No. 2 seed. If the Rebels should win Wednesday, they would play the Fresno State Bulldogs at 6 p.m. Thursday. San Diego State will open play at noon Thursday. UNR, the No. 5 seed, meets No. 4 New Mexico a 2:30 Thursday. The conference championship game is scheduled for 3 p.m. Saturday. Game 1: 11 a.m, No. 8 Wyoming vs. No. 9 Utah State. Game 2: 1:30 p.m. No. 7 UNLV vs. No. 10 Air Force. Game 3: 4 pm No. 6 Colorado State vs. No. 11 San Jose State. Game 4: Noon No. 1 San Diego State vs. Game 1 winner (CBSSN). Game 5: 2:30 p.m. No. 4 New Mexico vs. No. 5 UNR (CBSSN). Game 6: 6 p.m. No. 2 Fresno State vs. Game 2 winner (CBSSN). Game 7: 8:30 p.m. No. 3 Boise State vs. Game 3 winner (CBSSN). Game 8: 6 p.m. Game 4 winner vs. Game 5 winner (CBSSN). Game 9: 8:30 pm Game 6 winner vs. Game 7 winner (CBSSN). Game 10 3 p.m. Game 8 winner vs. Game 9 winner (KLAS-8).